Review: An unmanned, half-mile-long freight train barrelling towards Pennsylvania. 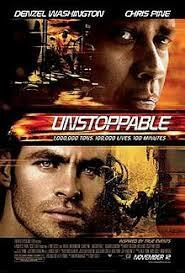 A veteran engineer (Denzel Washington) and a rookie train operator (Chris Pine). They try to save the day by stopping the locomotive. Inspired by a true story. A film that will pass the time quite happily. You would be disappointed if you went to see this in a cinema. Very predictable from start to finish. In this you have the character who is trying to make amends with his daughter and is always worried that he is going to lose his job. He rings her at work and she says she is too busy at work. We then throughout the film see her standing watching the TV. You have Chris Pine’s character who has fallen out with his wife and won’t ring her. Guess what happens at the end? They all act as though nothing had happened. Denzel Washington actually recommended Chris Pine to Tony Scott. This was Tony Scott’s last film before his death in 2012.